Do you wanna run better with flat feet? The New Balance 940v2 may be an excellent choice. This shoe features a unique design that helps you unleash your running potential. It has premium cushioning and supports to help overpronators run well. The midsole has plush padding to ensure your foot is cozy. Both the men and women versions have enough cushioning for comfort and support. You can use this shoe for running, fitness or casual walking. Its lightweight design offers you great flexibility. Although this shoe doesn’t come in numerous colors, it will match your tracksuits. Perfect for moderate to severe overpronation. The upper design has several technical features to suit your flat feet. But these features don’t add weight to your shoes. In the upper, there is a Phantom Liner and Synthetic Mesh. The mesh keeps your foot cool and dry during the race. The Phantom Liner enhances the shoe durability. Also, there is N-Lock in the upper. A webbing lace system secures your foot in place. The midsole features stability technologies to offer you better cushioning and stability. It has N2 low-to-the-ground cushioning technology for foot comfort. With this feature, you will enjoy responsiveness in low profile execution. The Abzorb Strobel Board offers your foot enough comfort. This feature also maximizes shock absorption. N-energy cushioning foam ensures your foot is cozy in each stride. The midsole also has ACTEVA Lite for stability and comfort. The Balance 940v2 has a rubber sole that offers you prime control. It has Stabilicore, a medical support system to provide you a cozy heel to toe transition. Non-aggressive tread pattern allows you wear this shoe on track, gravel, and road. The forefoot has brown rubber for responsiveness. Are you seeking running flexibility with flat feet? You will love the flexibility features of this flat foot running shoe. The forefoot cushioning offers you dynamic toe-off phases and enough flexibility. The custom fit feature keeps your foot flexible while running. The toe box is a bit large to ensure your toes move freely with the shoe. If you settle on this shoe, choose your actual foot size. This is because the shoe adheres to the standard shoe size. Hence, you don’t have to purchase a half bigger or smaller size than your actual foot size. 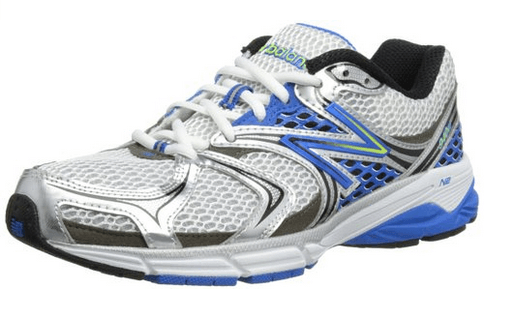 This shoe is designed to offer you enough stability throughout the race. A T-Beam Shank in the midsole improves shoe stability. This feature also enhances arch support to prevent your foot from injuries. Stability Web keeps your foot in place while enhancing the shoe stability. The heel section of this New Balance 940v2 shoe has extra cushioning that ensures your foot is well supported and stable. It boasts of gender-specific stability. These stability technologies suit the needs of mild and overpronators. So you will be able to control pronation quickly. These shoes are relatively thick in comparison to other stability shoes. The men version weighs 11.9 oz (340 grams). The women version weighs 11.2 oz (321 grams). Although this shoe is a bit heavy, the extra weight helps you to improve performance in running. You have only a few color choices in this shoe. Men can choose white with blue markings or steel with red velocity markings. Women can choose white with blue markings, pistachio. Or deep water with pistachio markings. The heel section is a slightly stiff. The forefoot offers a poor fit. Q. Is this sneaker good for people with wide feet? I want a large toe box and depth. A. It has a roomy toe box making it suitable for people with wide feet. Q. What is the length of the heel? A.It is approximately 4 cm and about 1-inch thick. Q. I tried the men’s version, and it has better arch support. What of the women shoe? A. Both versions have similar arch support features. I hope this New Balance 940v2 review will help you to choose the right one. This shoe is perfect for mild and severe pronators. It has excellent arch support and better cushioning. You will also love the breathability and stability features. However, it is relatively heavy, and the forefoot has a poor fit. You may also find the heel slightly stiff.